Parent/Teacher meetings will be held during the afternoons of Tuesday 5th March to Thursday 7th March. These meetings give you an opportunity to see your child’s progress, the next steps in their learning and also how you can help at home. Details for booking appointment times will be provided soon and if you have any difficulty at all with this, please contact jeremy.s@huahinschool.com or cheng.b@huahinschool.com . A huge well done to our swimming team at the weekend. There were personal best-times for every single swimmer and this is a tribute to their hard work in training and also of course to the dedication of their coaches. Jasmin, Prim, BB, Elisa, Jessica N, Lydia and Chai were all heat winners. 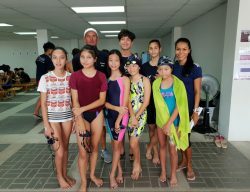 Particular congratulations go to the Bronze medal winners: Chai in the 13-14 year old freestyle and the girls 13-14 year old freestyle relay team, Jessica N, Jessica J, Natty and Lydia. Congratulations to Jessica Jardine, who swam excellent times in both Freestyle and Backstroke contributing towards a very good iGCSE grade. Well done to all the football players who represented the school against Halio. Many of the Y3/4 players played their first match for the school, which was great to see. Both teams were very competitive, with all players working very hard. Well done to our Duke of Edinburgh students, Robert and Viktor who have been coaching the Y3/4 team. They have displayed a very positive attitude towards their roles. They have been very organised and prepared their team for the match, giving them lots of encouragement throughout. This Thursday on February 14th there will be a non-uniform day organised by Year 10 students to help raise money for a project to help a refugee community in Pala-U. Students in Years 1-10 are invited to come to school in red, white or pink clothing on Valentine’s Day. The suggested donation for non-uniform day is 50 baht per student. In addition, there will also be a bake sale on the same day. The cupcakes will be 25 to 35 baht. It will be held outside the year four room on the stage, and will be held at lunchtime. Lieve and Robert. Students and teachers have been involved in assemblies, PSHE sessions and Computing lessons to discover the power of technology and to share top tips to stay safe. This has been to support the World Safer Internet project which is an ongoing focus for HHIS. Thank you to Mr Matt and Mr Lewis for a well received parent workshop on this very important topic. Please click this link to gain a summary of the internet safety tips for parents. On Tuesday February 12th at 3:45pm, parents of Year 9 students are invited to join secondary teachers for an IGCSE presentation and discussion of possible subject choices on these courses. Year 9 students are very welcome to attend and be involved in the IGCSE discussions. This meeting will be held in our new building and if you have any questions at all, please contact Mr Lewis ( lewis.c@huahinschool.com ). Just to remind you that there will be a meeting on Wednesday February 13th at 8:30am for parents to find out more about developments in the school. This is also an opportunity to ask general questions. The meeting will be held in our new building, upstairs in the English classroom. As a result of further expansion, we will be recruiting additional teachers for August 2019. I will be going to London in the week beginning February 25th to interview candidates, along with Directors Graham Sullivan and Monica Sudhirak. We have been fortunate again to have had an excellent response to our adverts and have selected some high calibre candidates to meet. The selection process will once again be tough. Whilst I am away Mr Lewis will take responsibility for the whole school. Phase leaders are of course responsible for their areas but a named phase leader is always given overall responsibility in my absence. Friday February 15th is the last day of this half term and we return to school on Monday February 25th. Have a good break with your children. ทางโรงเรียนจะจัดประชุมผู้ปกครองในช่วงเวลาบ่ายของวันอังคารที่ 5 มีนาคม ถึง วันพฤหัสบดีที่ 7 มีนาคม 2562 การประชุมครั้งนี้ จะเปิดโอกาสให้ผู้ปกครองได้รับทราบข้อมูลพัฒนาการด้านการเรียนของนักเรียน และการเรียนขั้นต่อไป ซึ่งจะทำอย่างไรที่ผู้ปกครองสามารถช่วยสนับสนุนที่บ้านได้ สำหรับการนัดหมายเวลาประชุมจะถูกจัดส่งไปให้ผู้ปกครองเร็วๆ นี้ หากผู้ปกครองไม่สามารถทำการจองได้ กรุณาติดต่อ jeremy.s@huahinschool.com หรือ cheng.b@huahinschool.com . ขอเรียนเชิญผู้ปกครองนักเรียนชั้น Y9 พบครูระดับมัธยมเพื่อรับฟังข้อมูลโปรแกรม IGCSE และความเป็นไปได้ของวิชาเลือก ในวันอังคารที่ 12 กุมภาพันธ์ 2562 ตั้งแต่เวลา 15.45 น. โดยนักเรียนชั้น Y9 สามารถเข้าร่วมรับฟังได้ การประชุมครั้งนี้จัดขึ้นที่อาคารเรียนใหม่ ชั้น 2 หากผู้ปกครองมีคำถามเพิ่มเติม โปรดติดต่อ Mr Lewis ( lewis.c@huahinschool.com ).